NEW Premium Certified Non-GMO & Allergen Free Spray available upon request! Now you can enjoy cooking without worrying. No more counting, just enjoy what you eat. Healthier, better and the right choice. Eating Healthy Is What We Do. 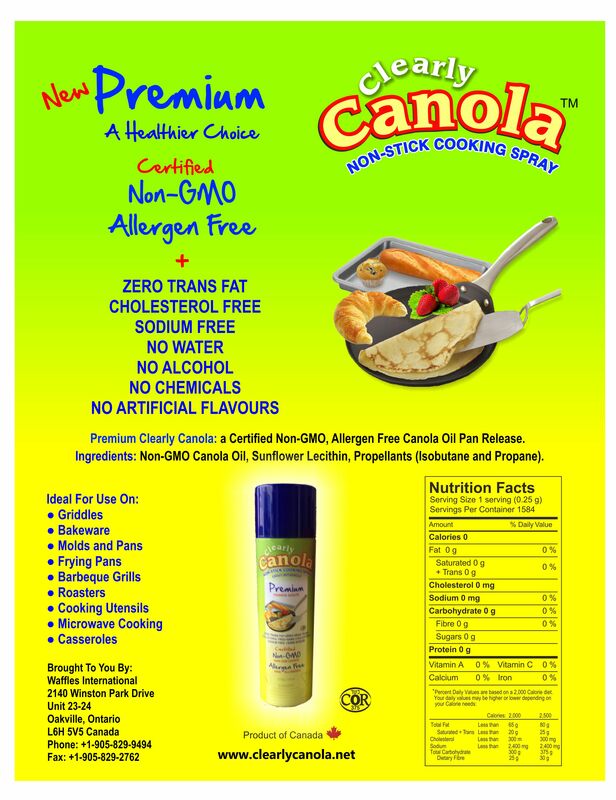 Clearly Canola is a healthy non-stick cooking spray with no added fillers or chemicals. Eat without worrying! Enjoy the quality and taste of Clearly Canola cooking spray as you pan fry, bake or roast without ordinary shortening, butter, margarine, cooking oil or grease. Foods won’t stick on pan – serving is easy and so is clean up. We’re always trying provide a healthier alternative that leads to customer satisfaction and make them eat healthier and happier. Clearly Canola has a common goal of wanting our customers to eat healthier without sacrificing anything. Gone with the bad, in with the good. "I've used Clearly Canola for over 2 months. Definitely a great alternative to other non-stick sprays." "I've never been happier since switching to Clearly Canola! It feels great when I know I'm eating healthier." Clearly Canola is the best choice for healthy eating with Zero Trans Fat, Cholesterol Free and Sodium Free.. Pure oil, no soy based foam fillers or water added. We only offer honest products, and you get pure oil in each can, that is what you are paying for. No harmful chemicals are found in Clearly Canola and a clean ingredient deck. What you taste is pure and won’t change the taste profile of your cooked products.